I can’t really believe I have only been in New Zealand for 48 hours. So much has happened. For a start, I am now two Kiwi mullets down and another one thrown into the mix. Since yesterday, after my Radio NZ interview, I’ve been north of Auckland, bagging a couple of mullets (including this one above). On the back of that interview, however, I got an email from someone in Invercargill telling me about Mullet Bay just to the west of there on the south of South Island. I knew about Mullet Road down there from several people. Street names, however, don’t count. 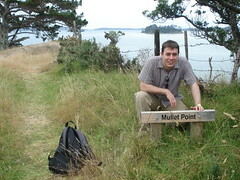 Neither do pubs, shops, people or cats call Mullet (nice though they are to see if I am passing by). But what my Invercargill correspondent told me, which I had not realised, is that Mullet Road finishes up at Mullet Bay – here, near the delightfully-named village of Cosy Nook. So that makes a fifth mullet I’ll need to visit, and significantly alters my travel plans. Much as it is great that I will be able to get to the bit of the country I have most (mullets aside) wanted to visit, it does mean that my itinerary will require some serious thought and logistical planning to pack the extra mullet in. Ah well. My own idle fault I suppose. Saturday 5 January 2008 in Mullet hunting, Travel.